When does a septic system design need to include a pressure distribution leaching system? Prior to the 1995 changes to the Massachusetts Sanitary Code (310CMR 15.00), a pressure distribution system design was not required. The 1995 Code revision did not have any actual design criteria except for a requirement to utilize a pressure distribution system when certain thresholds were reached. The actual design methods were contained in a Department of Environmental Protection (DEP) policy document . This “policy” called Title 5 Pressure Distribution Design Guidance, has been further revised to address the technical questions that were raised by the original policy (Policy#BRP/DWM/WpeP/G02-2, effective May 24, 2002). The more recent revision to the Sanitary Code appears to have added more confusion. My office recently prepared a septic system repair design for a small manufacturing facility located in an industrial park. The total facility design flow was less than 2,000 gallons per day (GPD). The proposed design included a gravity style distribution to the leaching system, but needed a pump system to bring the flow from the septic tank to the gravity distribution system. The local health agent reviewing the design plan was of the opinion that the design needed to use a pressure distribution system. Unlike a conventional gravity style system, a pressure distribution system uses a force main pipe from the pump chamber to a larger diameter manifold pipe (can be a central manifold or an end manifold). 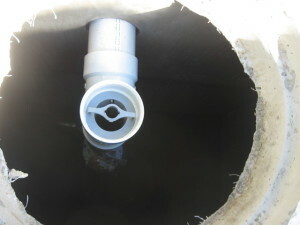 A series of smaller lateral pipes are fed from the manifold pipe. These lateral pipes have a series of small diameter holes spaced along the length of the lateral pipe. These holes in the lateral pipes thereby spray the pumped effluent under pressure into the leaching system. Pressure distribution systems are more expensive to install as compared to the conventional gravity systems. When the health agent first questioned the design, I explained that the Sanitary Code, under 310CMR15.254(1) allowed for dosing pumps for systems with a total design flow less than 2,000 GPD provided that there is a gravity distribution system. The health agent did not agree with my reading of the Code and contacted the regional office of the DEP to get an “official” opinion. The DEP engineer actually sent a fax that stated that all pumped systems had to be pressure dosed and attached the section of the Code related to pressuring distribution (310CMR15.254(2)). Once I was given a copy of this DEP fax document, I contacted the same engineer at the DEP and suggested that he not skip to the second paragraph in the Code section 15.254 that he cited, but start at the first item that clearly allows for pump dosing to a gravity distribution system for design flows under 2,000 GPD. I explained that pressure distribution systems, while an option, are not typically used on small systems. 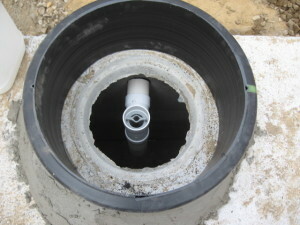 For example, if an existing small single family house, under a repair design, needed to have a slightly elevated leaching system due to high groundwater, and the plumbing location prohibited a total gravity system, then, under the “all systems using a pump” opinion, this property would be forced to have a pressure distribution leaching system. I then went through the appropriate Code section wording with the DEP engineer and discussed the differences between the two paragraphs. The DEP engineer then issued a new fax to the health agent correcting the earlier fax and noting that the pumped system design was allowed and that “pumped” systems without pressure distribution is acceptable provided that they meet the Code criteria. At that point, the health agent, under the authority of the Board of Health, approved the design plan and issued the construction permit. If I had not insisted that the DEP engineer had been incorrect, my client would have had to pay for an expensive pressure distribution system. An engineer who does not have a good working knowledge of the Massachusetts Sanitary Code as well as the experience in both pump dosing and pressure distribution system design would not have questioned the health agent’s opinion and definitely would not question a DEP engineer. I recently heard about an example of how experience impacted a pressure distribution system project. A local contractor, was installing a pressure distribution system (not one of my designs, thank you) when the local health agent had him tear out the manifold and lateral connections. The design plan, according to my source, did not detail how these connections were to have been made and the contractor built what he thought was correct. A more experienced design engineer would have had that detail presented on his plan, since that piping connection is one of the more critical components of the pressure distribution system. This lack of detail not only resulted in more work and expense for the contractor but delayed the completion of the system construction. This is one of my typical pressure distribution system design details. Clients do not appreciate an engineer gaining on-the-job training on their projects. While there are some people that base their decision to hire an engineer on the lowest price, the smart consumer looks at experience, reputation and integrity in combination with the cost to establish the “value” of a project.